Did you know that there are 31,536,000 seconds in 2017? World Animal Day is quickly approaching... can you give a little time to make a lifetime of difference for animals? 31,536,000 SECONDS will have passed since last October 4… CAN YOU SPARE A FEW? Add a pledge to the World Animal Day website. Every pledge makes a difference… what will YOURS be? Follow World Animal Day on Facebook and Twitter. Boost October 4 on social media by sharing or tweeting our eye-catching flag graphic (various languages are available). Support World Animal Day. Find out more about the project Naturewatch Foundation is sponsoring this year. Thank you! 525,600 MINUTES will have passed since last October 4… CAN YOU SPARE A FEW? From now until World Animal Day is over, please continue to share World Animal Day posts! Use our hashtags, #WorldAnimalDay and #October4 - let’s keep World Animal Day trending on October 4! Take a selfie with our logo poster to show your friends and family that YOU CARE ABOUT ANIMALS... ask them to take one too! Fire off an email to Google, supporting our doodle campaign. Tell them why this special occasion deserves to be recognised on their home page. If you’re planning an event for another occasion, you can easily adapt it to be a World Animal Day event by using the logo and printing promotional materials from the resources page. Don't forget to register and add your event! 8760 HOURS will have passed since last October 4… CAN YOU SPARE A FEW? Hold a Vegan Cupcake Sale… here’s a list of 19 yummy recipes to inspire you! Then donate the proceeds to your favourite animal welfare charity. Involve your customers' children in a social media design competition featuring your chosen animal welfare campaign. Post the winners and other entrants on your social media pages. Attend an existing event that has already been organised to show your support for World Animal Day. You can find lots of great events here. Host an animal welfare information table and charity collection at lunchtime, using our poster and resources. Most people carry their phones, so ask them to help boost World Animal Day on social media! 365 DAYS will have passed since last October 4… CAN YOU SPARE A FEW? 'What a difference a day makes. Twenty-four little hours.' It’s amazing how much can be achieved in such a short time! Organise a quiz night in a pub close to your workplace. Charge an entrance fee, which will then be donated to the animal charity of your choice. Why not try a vegan or vegetarian diet for a day, if you aren't one already? Or organise a week-long 'Come Dine with Me' type event with friends, specifying a 'no meat' menu? Want to help animals in a more hands-on way? Animal welfare organisations need volunteers year-round, not just on October 4. Check out these volunteering opportunities, both in the UK and overseas. 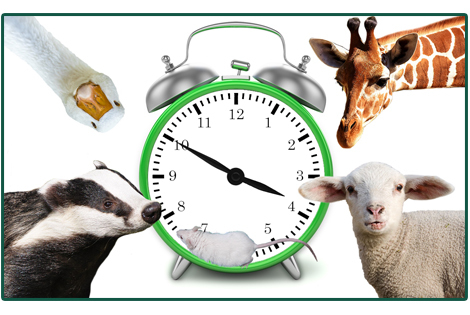 Keep an eye on the Countdown Clock on the World Animal Day homepage to check how much time you have left to get organised! Whether you can spare a few seconds, minutes, hours or days, please join us in celebrating World Animal Day 2017 on October 4!